Town Plans are visionary documents for all aspects of what a town would like to see happen to it over the next eight years. Town Plans are written by Planning Commissions and approved by either a town vote or a vote of the legislative body (Selectboards for most towns). Both Planning Commissions and legislative bodies have publicly warned hearings on drafts. The process of developing a Town Plan should involve extensive input and communication with the community as it is intended to represent the citizen’s vision for the future of their town. Additionally, Town Plans should include up-to-date information about the community including population, demographic and economic data. This information is used to help inform the plan. Town Plans are not required by law to be consistent with state planning goals (24 V.S.A. § 4302), but there are several state programs that require an “approved” Plan. The Regional Planning Commission, upon request of the community, can review a Plan for approval. To be approved, the Regional Commission must find that the Municipal Plan includes the required element (24 V.S.A. § 4382), is consistent with the state’s planning goals and is compatible with the Regional Plan. Town Plans are required by statute (24 V.S.A. § 4382) to contain a number of specific elements. In particular, Town Plans need to have a section (including a map) on the town’s desired future land use, and this section is not meant to be regulatory, but to guide subsequent regulations. However, they can have a regulatory effect in two places. First, if a Town Plan has specific, directive language (for example gas stations shall be prohibited from floodplains), conformance by a project with that language can be required in Act 250. Towns desiring less regulatory effect should use words such as “should”, “encourage”, and “consider” to ensure that their plans are not used in this way. Town Plans can also have a regulatory effect in the granting of access permits, in that these permits have to be compatible with the town plan. Town Plans are intended to be “living” documents that change over time to reflect the changing vision of the community. Through the Plan, it is intended that communities will implement their vision. Each Plan should have a range of action items that will help the community reach their vision. TRORC offers Town Plan technical assistance and will assist Planning Commissions with the process of developing and drafting a Town Plan on a contract basis. Municipal Planning Grants are one way to obtain funding for Town Plan’s in which you can hire TRORC to do the work with your Planning Commission. These are usually due in the fall with work commencing in January of the following year. Please contact Tory Littlefield at vlittlefield@trorc.org if you wish to apply for a MPG. The Vermont Planning Information Center (VPIC) has several resources available to communities on planning and zoning work in Vermont. A handy adoption checklist for plans and bylaws is found here. There are two parts of the checklist (one for plans and one for bylaws). Planning Commission Public Hearing: 30-day physical notice is required (certified mail) to surrounding municipal planning commissions, the regional planning commission and interested groups who request the notice in writing. The packet must include the following materials and a template is available at the end of the adoption checklist. An electronic copy of the packet must also be emailed to the Department of Housing and Community Development. hearing notice with chapter headings and a solicitation for comments. Selectboard Hearing: If a community has a population of 2,500 people or more, the selectboard must hold two public hearings. Anything less than 2,500 only one hearing must be held (at a minimum). No less than 30 nor more than 120 days after the planning commission hearing may the selectboard hold their first public hearing with a required 15-day notice in the newspaper and posted physically around the community. The notice requirements are the same as the planning commission hearing notice. There is no mailing at the SB level. Once the selectboard has their hearings, they have up to one year from the date of final planning commission hearing to adopt the town plan by selectboard vote or at a town meeting. Hearing Changes: Major changes at the PC level do not trigger another PC hearing as they send it along to the SB. Major changes at the SB level do trigger another SB hearing but it does not have to be sent back to the PC for another hearing. Just a copy needs to be sent back to the PC for their comments. Adoption: Adopted plans are effective on the date of adoption and must be sent to the regional planning commission and the Department of Housing and Community Development to be recorded. Adoption versus Amendment: TRORC recommends to treat all amended, adopted, or readopted processes as the same. Regional Approval and Confirmation (optional, but recommended): If a municipality wishes its plan or plan amendment to be eligible for approval under the provisions of §4350 of this title, it shall request approval. The request for approval may be before or after the adoption of the plan by the municipality, at the option of the municipality. Any such requests should be in writing and accompanied by a copy of the adopted or draft plan (by mail or electronically to TRORC). The TRORC Board of Directors holds the final decision on Town Plan approvals and confirmations. When requested, the regional planning commission shall review the municipal plan to determine if the document is consistent with the State’s planning goals, the Regional Plan and the approved plans of other municipalities in the region. Please see our town plan approval page for more information. The RPC will carry out and conduct all related and necessary reviews, hearings, and processes. The purpose of this manual is to provide a guide for municipal planning commissions in fulfilling their role and responsibilities as set forth in 24 V.S.A. Chapter 117, the Municipal and Regional Planning and Development Act. A major role of the municipal planning commission is to develop the municipal plan. 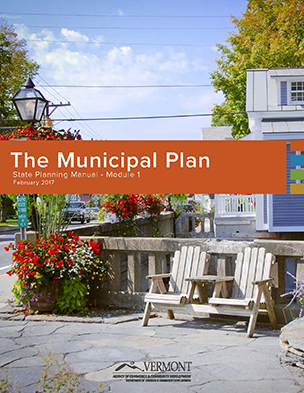 The Planning Manual provides information that will help the planning commission with this complex task, from designing the planning program to adopting the plan. New and up-to-date guidance to help citizen planners build consensus on the community’s top priorities and develop concrete action steps that local leaders can achieve. 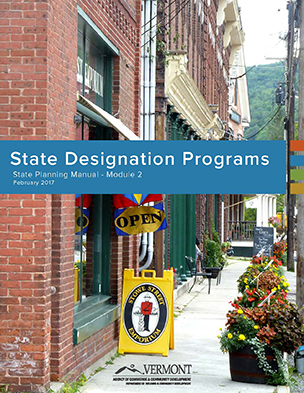 A concise guide on the five VT designation programs and their benefits — along with case studies that show how communities have used the designations to achieve their goals. Module 3: Best Practices in Plan Implementation [Forthcoming] – until Module 3 becomes available, refer to the Vermont Land Use Planning Implementation Manual – a package of 30 topic papers introducing a wide range of concepts, tools, and techniques for helping communities achieve their planning goals.